Can cells produced from autologous induced pluripotent stem cells (IPSC or IPS cells) sometimes be immunogenic in patients? This key question has remained somewhat unsettled due to varied findings over the years (e.g. see here), but many of us had generally felt in the last couple years that immunogenicity in an autologous context wouldn’t be a major problem. This is a big deal because if human IPSC (hIPSC) and in particular their derivatives are immunogenic (sparking a major immune response once transplanted that destroys them) even in an autologous setting that could necessitate the use of immunosuppression with their clinical use. In turn this would substantially reduce their potential advantage over human embryonic stem cells (hESC) for various clinical applications. Immunosuppressive therapy can be expensive and has its own potential side effects too for patients. A new, very important Cell Stem Cell paper from a team led by Professor Yang Xu sheds significant new light on this key issue, but interestingly leaves the question answered so far at least as both “yes” and “no”. In short, autologous hIPSC derivative immunogenicity is present in some instances and not in others. The researchers used an innovative humanized mouse (Hu-mice) immunological model system. You can see a summary in image form from the paper above. They found that hIPSC derivative immunogenicity depends on the type of differentiated cell that is produced and the specific, associated antigens. Therefore, how IPSC are made will impact their immunogenicity. 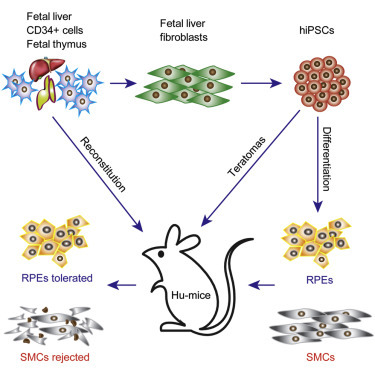 The data in this paper on RPE is encouraging, but the observations with SMC raise broader awareness that hIPSC derivatives cannot simply be assumed to be non-immunogenic in an autologous setting. What about liver, kidney or neural derivatives of hIPSC? Lung, heart? It is also possible, since everybody’s immune system is different, that immunogenicity of any given hIPSC-derivative will vary depending on the patient. If the immunogenicity of every patient’s hIPSC-derived cells ideally would be tested prior to transplantation, how would we do that? We’d need some kind of robust, high-throughput system like the teratoma and gene expression assays that are now used to screen human pluripotent stem cells for potency. Could the Hu-mice be used for this? The Hu-mice used here are indeed an elegant system, but how things play out in actual human patients with their own immune system could be different. Still they or some adaptation of that technology could prove very effective as an initial screening system. Overall the findings of this new paper along with the recent news of the halt on the hIPSC trial for macular degeneration, together are signs of a more complicated road ahead to the beside for IPSC. They are not insurmountable hurdles, but rather indications of the IPSC field maturing to have a clearer understanding of the challenges facing it. This is a good thing, even if a bit bitter sweet, because it means we can find solutions and move forward. I think you misunderstood the authors. In that quoted paragraph they suggest the problem is in the differentiation protocol from iPSC, and not in the reprogramming protocol for iPSC generation. If my baby thymus was sitting disassembled inside my kidney capsule, and didn’t have the privilege of going through normal human development, I’m pretty sure I would have a sprinkle of improperly educated T cells and just a tad of autoimmune disease. The fact that different cell types have different “rejection” profiles shouldn’t be much of a surprise either given that we have no idea how human T cells are educated in the BLT mouse or whether these cells are expressing bucket loads of CTLA4 or something like that. The conclusions drawn from this paper are objectively wrong and should not be given any further thought. The fact that they saw a difference between an ESC and an iPSC reflects the simple difference that T cells selected against one HLA profile, really don’t like other HLA molecules and that there is some level of baseline education in the BLT mouse, which has been known for a long time since the BLT mouse can live quite some time without overt GVHD (but it does get some). The path to regulatory approval is made more difficult by the perpetuation of misinterpreted data through the literature, especially through high profile publications like Cell Stem Cell. This paper should have been rejected faster than an autologous iPSC-derived smooth muscle cell in a barbaric humanized mouse. Even acknowledging that a paper like this is “very important” sets the field back. Although this concept is very important, this paper is not, and hopefully the people who actually have to make decisions about the immunogenicity of stem cells know a little bit about immunology. The good part about this paper is that it teaches us that the BLT mouse may be a really useful tool for dissecting HLA-dependent rejection issues. For example, it shows that when you have neo-antigen presentation in the context of a matched HLA that you get specific oligoclonal T-cell expansion in vivo.